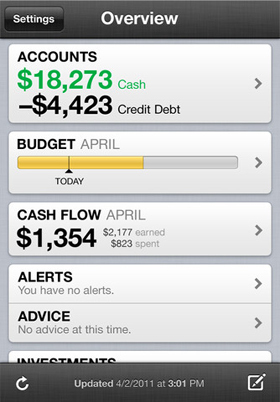 I have compiled a list of iPhone apps that will help you manage your money. Managing your personal finances can be very challenging. It requires strict attention to details and requires that you keep a record of everything you earned and bought. This means keeping tabs on the inflow and outflow of your money. Here’s the good news! This mind-numbing task is mind-numbing no more, thanks to iPhone’s Managing Money Apps. 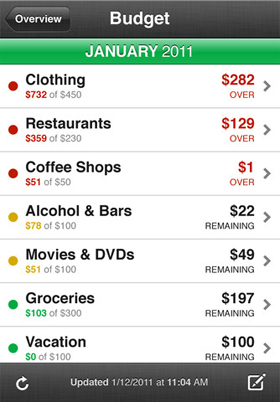 What are these iPhone Apps that can help users manage their finances? 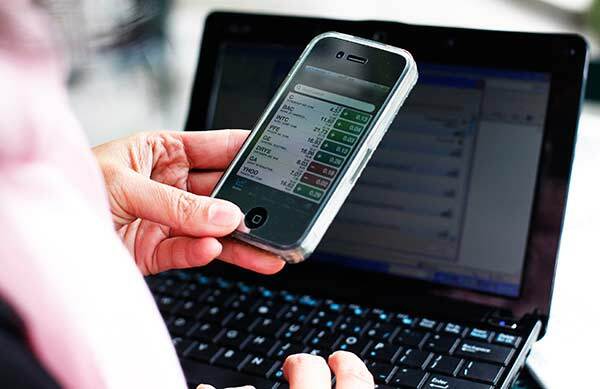 Here’s a list of these iPhone 4 applications for everyone who’s eager to start managing their finances the high-tech way. PayPal is listed under the category Finance and is free. Itunes.apple.com describes the PayPal social iPhone Apps as the easiest and most convenient way of sending money to just about anybody. The App is free; it’s safe and secure; and easier compared to personally going to an ATM to withdraw money. It’s also handier than writing or issuing checks. 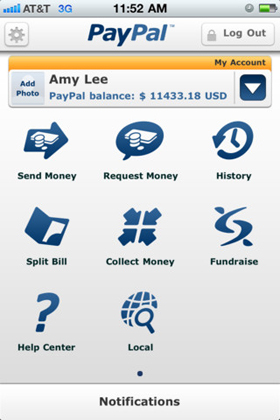 There are numerous advantages of using PayPal App. 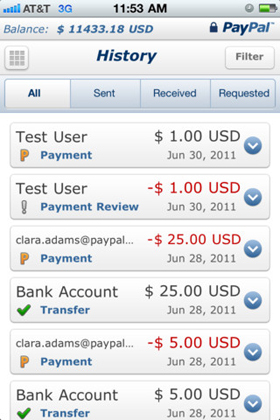 Users can do many things with Paypal App. They can easily send money as gifts; collect money for a group gift; and/or repay a friend. Users can also take a picture of a check to add money directly from their iPhone without any charges or fees. Users can also donate to a charity and share it with friends by posting it on Facebook, Tumblr, or Twitter. Users can also check their balance, withdraw funds, and/or view past transactions practically anytime and anywhere using the Paypal App. This app is categorized under Finance and is free. Mint.com Personal Finance allows their users to easily manage their finances on-the-go. It lets the users see all their accounts safely and securely in one place. Users can set up budgets using the application. With this app, users can avoid late fees. They can also very easily monitor cash flow; stay updated with text alerts and emails for due dates, fees, low balances, budgets, and many more. For those who are concerned on whether this app is safe since this involves finances, makers of the app assure the users that the app is safe. The app is passcode protected, with a unique 4-digit PIN. In the event the user loses his phone, or in instances when he temporarily misplaces it, the user can simply deactivate iPhone access from Mint’s profile page. This will prevent unauthorized access to Mint on the lost or misplaced iPhone. BillTracker is an App listed under the category of Finance. What can this app do? According to itune.apple.com, BillTracker allows users to be updated with their account information such as bill due dates, total amount due, indications whether the bills has been paid, payment confirmation numbers, and more. The BillTracker can also very easily generate recurring bills. It can track account information including websites, account numbers, as well as phone numbers. The application also allows users to call account phone numbers directly from BillTracker; and it allows users to open account websites in Mobile Safari. 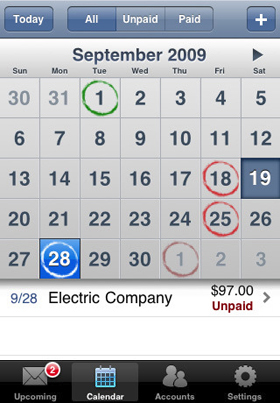 One of the best things BillTracker can do is to remind users about due dates of bills. 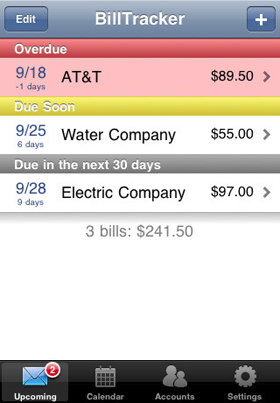 BillTracker will alert its users when a bill is soon due or when it is past due. BillTracker will also highlight those bills in the list so that users will not forget. BillTracker keeps a complete history for each account, meaning every bill that was paid and other important information related to the payments. It’s very easy to use because BillTracker automatically uses the default currency set for the device. So, which Free iPhone apps you guys are using to manage your expenses, share those iPhone applications with us via comments below. Previous: Is Windows Phone a Better Option than iPhone or Android?